Hypatia Inc. contact information.....................Wrong "Hypatia" site? Click here for others. Do not fail to install Operating Software version x.65 into your Model 308 or 309 promptly if it's now using an earlier version. Installation is very easy, very fast, and free. It's a matter of safety, ethics, and potentially a matter of legal liability (here's why). Installation of the latest Operating Software is a mandatory annual certification requirement. If your calibration service provider failed to install the latest Operating Software, their certification is invalid - return the instrument to them for rework. A quick Operating Software installation guide. Operating Software downloads and references. Operating Software history and malfunction notes. Owners of the following serial numbers are strongly encouraged to take advantage of a substantial free upgrade to current Model 309 hardware and software standards: 291, 296, 297, 302, 303, 304, 305, 308, 312, 313, 326, 331, 336, and 389. 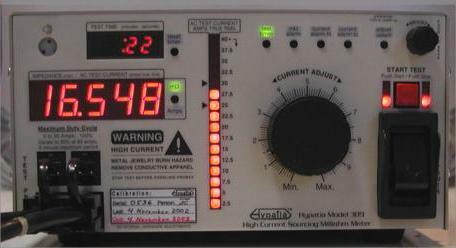 Model 309 High Current Sourcing Milliohm Meter: $2,000 including accessories. Network Cables: Purchase info. Technical Info. Calibration and performance verification: $75 For before and after data (default), $65 after data only *. An additional $13 will be charged if probes or other accessories are returned with the instrument, to cover the cost of tracking and packaging these items. Please do not include any accessories unless they require separate repair service. Models 308 and 309 Note: For the Model 308 and 309, installation of the latest Operating Software is mandatory - no exceptions. These are safety mission instruments. Failure to install the latest Operating Software is negligent and may create a serious legal liability. Hypatia specifically prohibits certification of instruments using any obsolete version of the Operating Software, and does not warrant the accuracy or performance of any instrument so serviced. (Consider the details here.) Hypatia promptly reports third party service quality failures to instrument owners whenever we become aware of them. Model 309: New Model 309 instruments may not be available at this time. Please contact Hypatia for information about availability. Our credit terms are: Net 30 days from delivery date, or original invoice transmission or postmark date, whichever is later, to payment transmission or USPS postmark date, 1.5% per month interest computed daily thereafter, single full payment required, 100% strictly enforced. No additional grace period is provided (zero "gray" area). These terms apply to all credit sales without any exceptions. Please do not request extended terms or price discounts. All credit orders must be accompanied by your organization's employer ID number (federal tax ID number). This means: Immediately following the expiration of the 30 day grace period, interest charges accrue and are computed daily. Late payments must include interest charges computed at the rate of .049315% per day. Payment must be made in full, including all accrued interest, in one single payment - multiple payment mechanics are not allowed, and short payments are always returned for correction at the customer's expense in order to prevent an attempt to evade responsibility for accrued interest through economic coercion in the form of imposition of high management costs for small amounts due. Hypatia never tolerates terms abuse or any other form of financial misconduct. If your organization has a "no interest payment policy" of any kind, you must either prepay your order or add a note to your PO that explicitly waives the policy, and explicitly states credit terms as "Net 30 days, 1.5% per month interest computed daily thereafter, single full payment, absolutely strictly honored". If neither option is possible, seek an alternate vendor - Hypatia is legally obliged to reject any PO, policy, or condition that conflicts with our credit terms. Funds for prepaid orders are not negotiated until the order ships in full. Millennium Ready: All Hypatia products, software, and corporate systems (Macintosh based) are fully Y2K compliant. Click here for details. As you know, modern product development requires consistent attention to safety standards from conception through design, manufacturing and support. Part of the focus for any grounded product (one with a three wire power cord or other grounding means) must be the proper design and testing of the protective ground system. That system must be able to safely carry the high currents that can be produced by primary or other high voltage wiring faults, yet never allow a hazardous voltage to appear on an accessible area for an excessive period of time nor suffer a significant performance degradation. The ground system must therefore be stout, and it must demonstrate this quantitatively under simulated fault conditions in order to satisfy safety certification agencies such as UL, ETL, CSA, VDE, TUV, BABT and others. Hypatia high current sourcing milliohm meters address your requirements for ground system testing through every phase of your product's life. They provide the high AC test current, impedance measurement range and precision necessary to meet the verification requirements of safety certification agencies. In addition, the Model 309 is computer network capable. And since its network interface is card slot based, it's able to easily accommodate changing network technologies. For manufacturing environments, the Model 309 additionally provides front panel automation and virtual instrument features to make repetitive testing simple and efficient. This instrument is straightforward to use, rugged, reliable, well supported with a two year full service warranty, and designed to meet or exceed UL 3111. (However, as of 1 January 2008 this instrument is no longer listed to UL 3111 by ETL. The design, construction, testing, and calibration of the instrument has not changed, but rather Hypatia no longer maintains the ETL certification service due to the high costs of the service relative to the sales volume of this instrument. Please contact Hypatia Inc.if you have questions or concerns about this aspect of the instrument.) In addition, it offers state of the art design which achieves precision without hardware adjustments. The annual performance verification or software calibration, provided in the owner's manual, is a straightforward closed case procedure. All instruments include an NIST traceable certificate indicating the results of performance verification using equipment and procedures meeting the requirements of MIL-STD-45662A. This certificate includes a listing of actual test data to address your ISO 9000 requirements. Every instrument includes any two of several available remote sensing modular probes terminated with alligator clips, an IEC power connector or a North American plug receptacle for rapid connection to your product's required test points. Optionally, an unterminated end probe may be ordered for connection to your international power receptacle bank or custom connector. All probes are easily interchanged, and are in keeping with value conscious pricing at $38 to $65 each when purchased as accessories*. Custom lengths are also available. If your engineering efforts would benefit from the highest possible precision four terminal Kelvin connected measurements, you may order a pair of independent Kelvin connection probes (Model 109) for only $20.00*. Besides offering even further precision, Kelvin connections allow impedance readings to be taken at intermediate points within a ground system under test without changing the high current connection points, a significant analytical advantage in design and development work. Hypatia isn't the only vendor in this field, but we think we offer the highest quality, performance and value for this application. Our instruments are modern, professionally designed, honestly specified, and carefully manufactured with excellence and attention to detail as high priorities. True RMS based measurements, direct digital readout of impedance and other parameters at higher precision, a test connection system of unsurpassed accuracy and superior efficiency, and freedom from hardware calibration maintenance are among benefits not offered by our competitors. We also provide support, including operating system and utility software updates, on our web site. If you have or anticipate a need for ground integrity testing, we hope you'll consider the Hypatia advantage. We'd like to add you to our growing list of satisfied customers. The performance of our instruments will better assure the safety of your products. And their efficiency and value will better assure the success of your business.